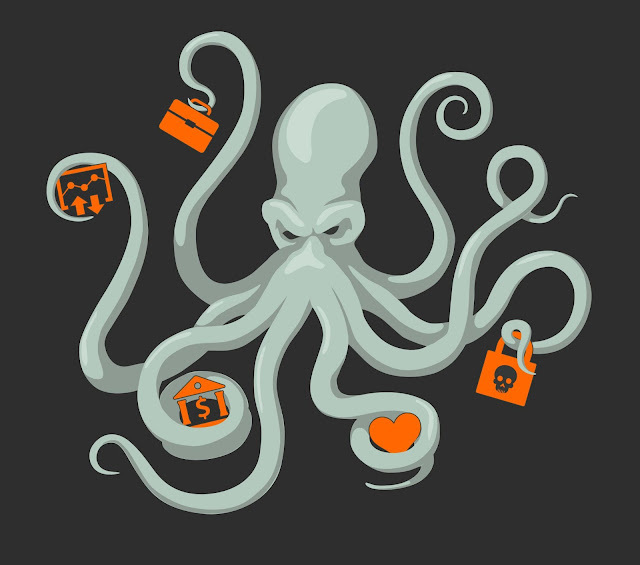 Over the past five years the Necurs botnet has established itself as the largest purveyor of spam worldwide. Necurs is responsible for emailing massive amounts of banking malware, ransomware, dating spam, pump-n-dump stock scams, work from home schemes, and even cryptocurrency wallet credential phishing. Necurs sends so much spam that at times Necurs' spam campaigns can make up more than 90% of the spam seen by Cisco Talos in one day. To conduct a deeper analysis of Necurs, Talos extracted 32 distinct spam campaigns sent by Necurs between August 2017 and November 2017. The result was a collection of over 2.1 million spam messages, sent from almost 1.2 million distinct sending IP addresses in over 200 countries and territories. From an email marketing and delivery perspective, Necurs doesn't appear to be too sophisticated. Necurs' recipient database includes email addresses that have been harvested online, commonly deployed role-based accounts, as well as email addresses that appear to have been auto-generated. These are among the worst, most unreliable sources for obtaining email addresses, and any legitimate email marketer wouldn't last a day mailing to addresses such as these. Of course, an illegitimate botnet such as Necurs has no such concerns. For many months the email addresses in Necurs database seemed to be largely static; Necurs hasn't actively added any new addresses for at least the past year, possibly two years or more. In November of 2017, Necurs stopped mailing to many of the autogenerated accounts. At one of my personal domains, Necurs has been seen mailing to addresses such as 'equifax@' --an email address that was originally stolen from Equifax years before the 2017 breach. Necurs also often mails to 'thisisatestmessageatall@', another email address I generated and put into the wild, long ago. There are also variations on other legitimate addresses, for example 'aeson@', '20jaeson@', and 'eson@' which are all variations on my address 'jaeson@'. The number 20 was present at the beginning of many of Necurs recipients. Hex 20 corresponds with the space character and is used in percent-encoding, etc. This provides further indication of the harvested nature of these addresses. Other addresses in Necurs' mailing list appear to have been auto-generated. For example 'EFgUYsxebG@', 'ZhyWaTmu@', and 'MTAyOvoYkx@' have never been aliases at my domain that I've ever used, and the only mail these accounts ever receive comes from Necurs. From our set of Necurs' spam messages, Talos extracted only the user alias portion of the To: address. There are numerous email aliases, such as role-based addresses, that appear to be in Necurs' recipient DB across many different recipient domains. 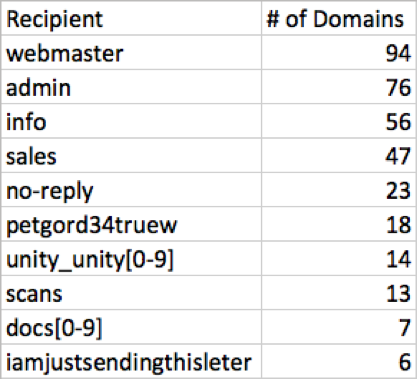 Strangely, the list also included some odd email aliases deployed at multiple domains such as 'unity_unity[0-9]@', 'petgord32truew@', 'iamjustsendingthisleter@', 'docs[0-9]@', and others. 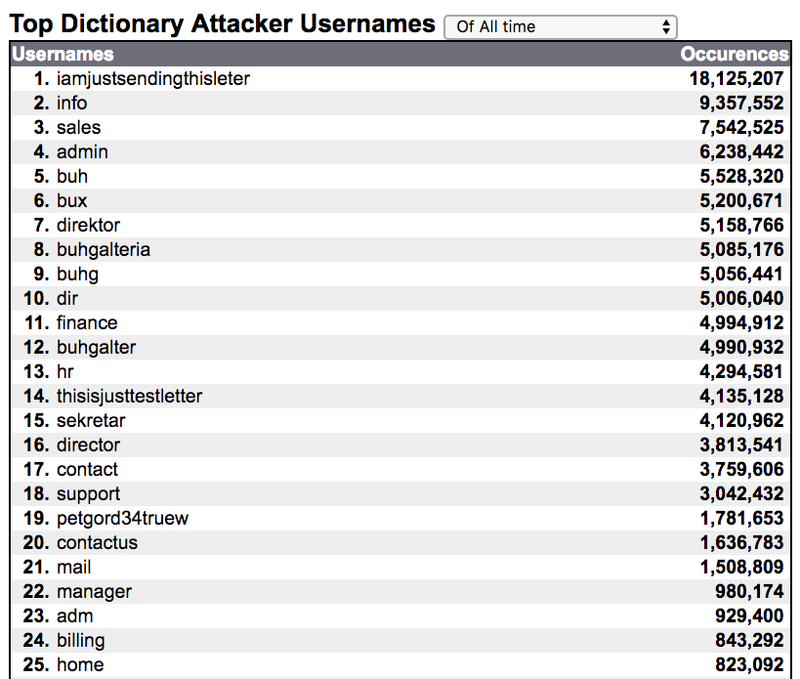 Interestingly, some of these same strange aliases can be found on Project Honeypot's list of the Top Dictionary Attacker Usernames, though it is unclear whether Necurs obtained their aliases from this list, or whether these aliases made Project Honeypot's list as a result of Necurs' spamming activity. Next, Talos extracted the sending IP addresses responsible for transmitting Necurs' spam emails, and we grouped the data according to geographical location. Rather than being uniformly distributed worldwide, a majority of Necurs' nodes were concentrated among just a few countries --India (25.7% of total spam), Vietnam (20.3% of total spam), and Iran (7.3% of total spam). More than half (51.3%) of the sending IP addresses in our data came from just these three countries. In contrast, other large industrialized nations were only responsible for tiny fraction of the spam. For example, the United States, was home to 6,314 (less than 1%) of Necurs sending IPs. The country of Russia was only attributed to 38 sending IP addresses out of a nearly 1.2 million total sender IPs! Talos also analyzed the individual spam campaigns in order to determine how often the sending IP addresses were reused from campaign to campaign. We found very little infrastructure reuse. In fact, none of the sending IP addresses in our data were seen across all thirty-two of the campaigns we extracted. Only three sending IP addresses could be found across thirty of Necurs' spam campaigns. The vast, vast majority of sending IP addresses, 937,761 (78.6% of the total), were only ever seen in a single Necurs spam campaign! This means that Necurs botnet is large enough to conduct attacks over several months without substantial reuse of most sending nodes --an impressive feat. 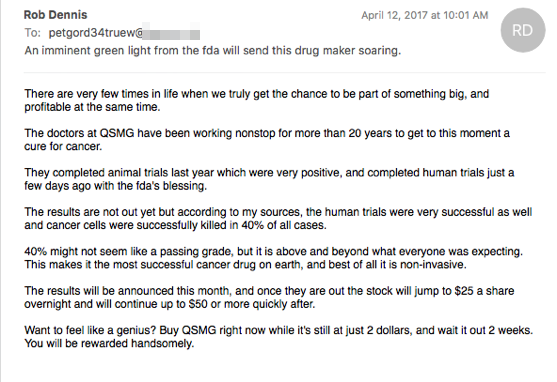 Below is an example of a pump-n-dump stock spam sent on April 12th, 2017 by Necurs touting the stock symbol QSMG, Quest Management Incorporated. On the following day the price of QSMG peaked at $2.33, probably netting the criminals a tidy gain on their initial investment. 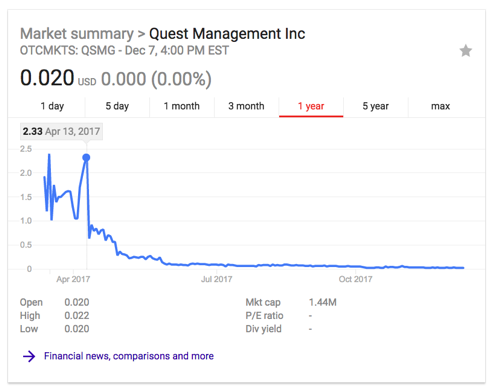 QSMG is currently worth less than $0.02. 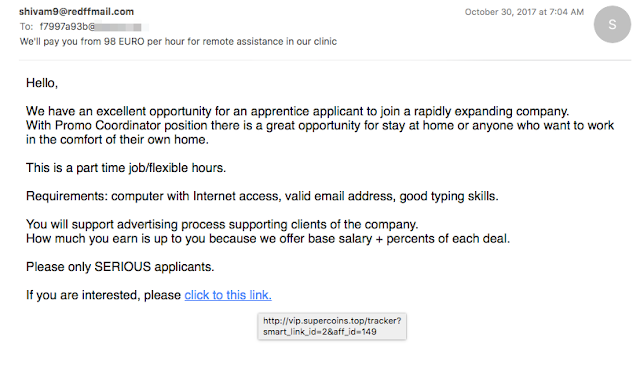 Necurs also sends dating spam. Recent dating spam have arrived without any URLs in the body, except a mailto: link to an email address. Current dating campaigns have involved the free email provider rambler.ru, but other previous dating campaigns have taken advantage of similar free email services such as gmx.com. Necurs' dating campaigns have also been known to include HTML links to fast-fluxed domains, or sometimes compromised websites (Wordpress, etc.). 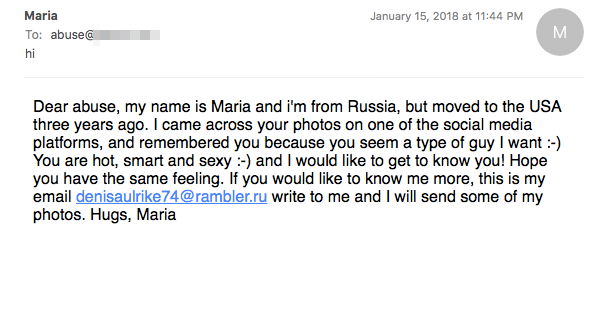 If you respond to one of these dating messages, you may be enrolled in a Russian dating website such as marmeladies.site. In this case, the criminals are making money by referring new users to these dating sites. Most likely they are being paid on an affiliate model. Of course one of Necurs' most well-known payloads is ransomware. 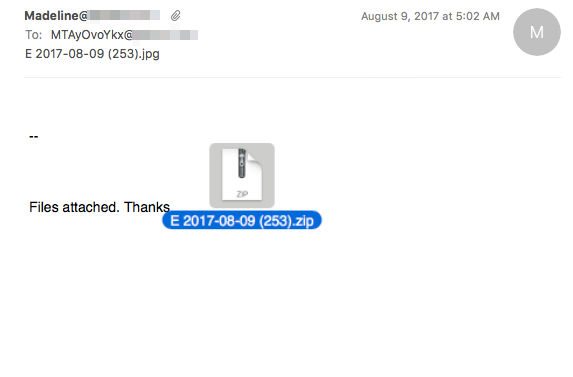 Necurs has been one of the biggest distributors of the Locky ransomware. Locky also works on an affiliate model. Inside of each locky sample, in the metadata, is an affiliate ID, which is always the same (3) for Necurs mailings. Most of the time, very little investment is made in the design of the messages themselves, as in the following example. The rise (and fall) in the value of digital currencies such as Bitcoin and Etherium has not escaped the attention of the Necurs criminals. They have been seen conducting attack campaigns using domains designed to look similar to legitimate wallet management websites. 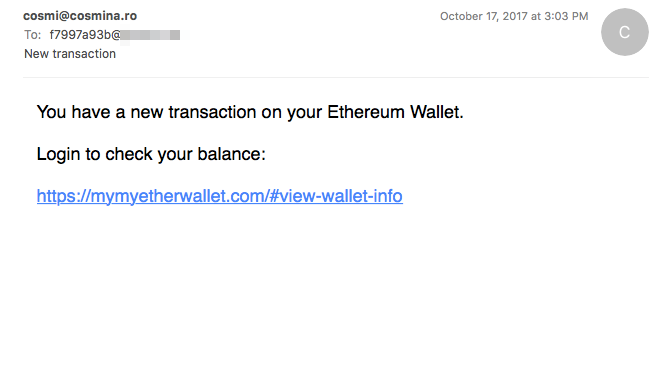 In the email below, note the extra word 'my' in the domain 'mymyetherwallet.com'. Recently, the Necurs attackers have drawn from previous stock pump-n-dump scams to come up with a relatively new tactic related to cryptocurrency. 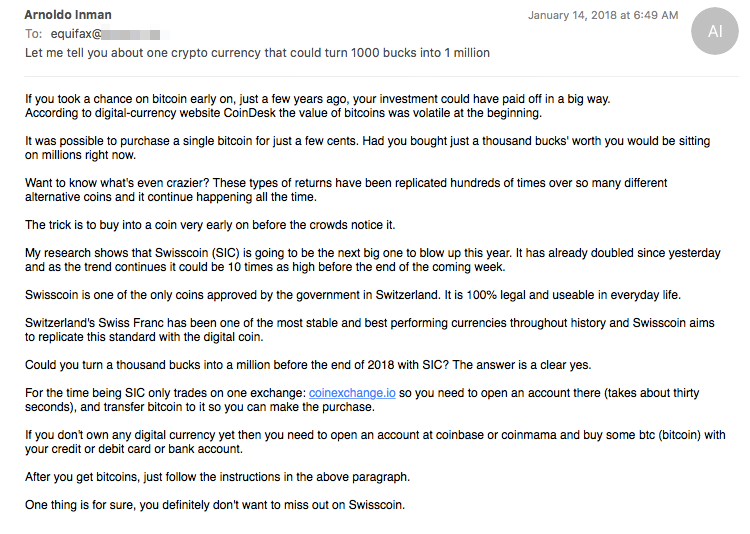 They had a spam campaign pumping Swisscoin (SIC). Checking the whois record for this domains we see the following registration details. 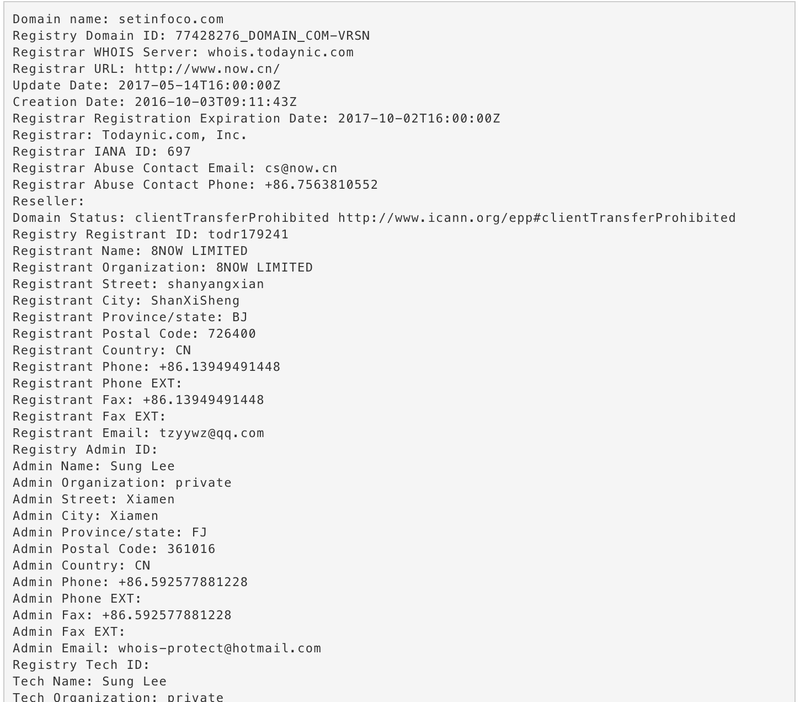 Note the registrant email 'whois-agent@gmx.com'. 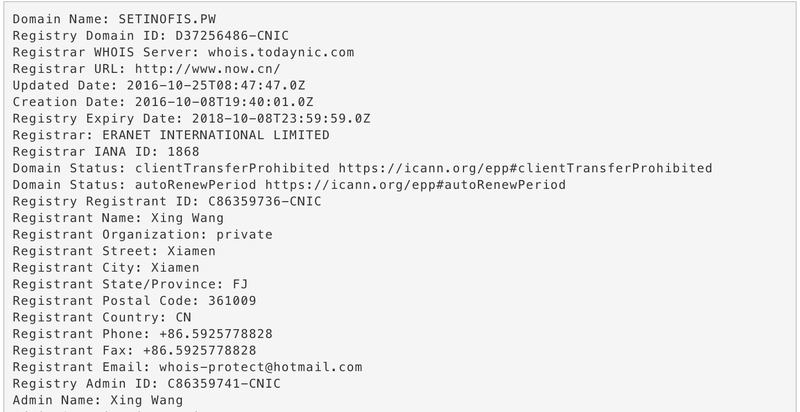 This is an attempt by the threat actors to convince the casual observer that the domain is somehow registered through a third party whois privacy protection service. 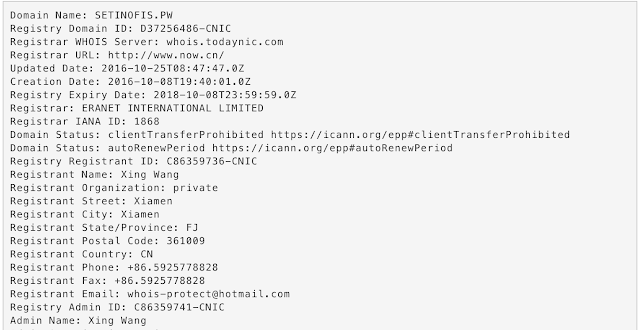 Email accounts @gmx.com are free to the public, and in this instance the attackers have simply generated the alias 'whois-agent' for their use in registering domains. A review of the domains registered to 'whois-agent@gmx.com' yields 399 domains (from DT as of January 17, 2018). 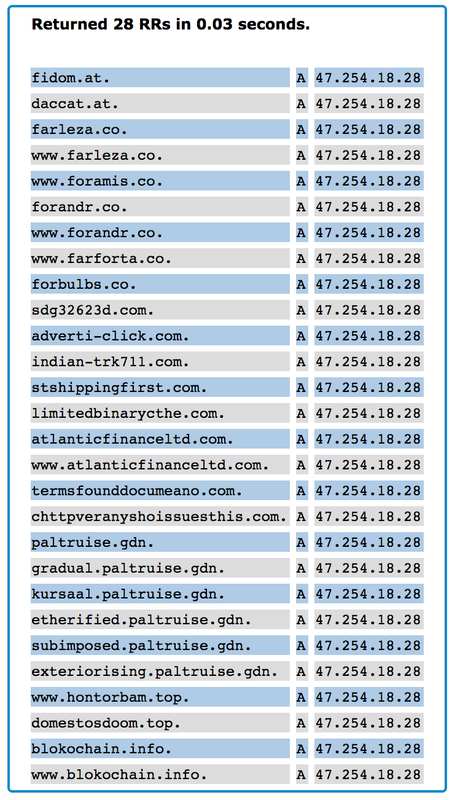 The list of domains registered to 'whois-agent@gmx.com' reads like a who's-who of criminal activity. 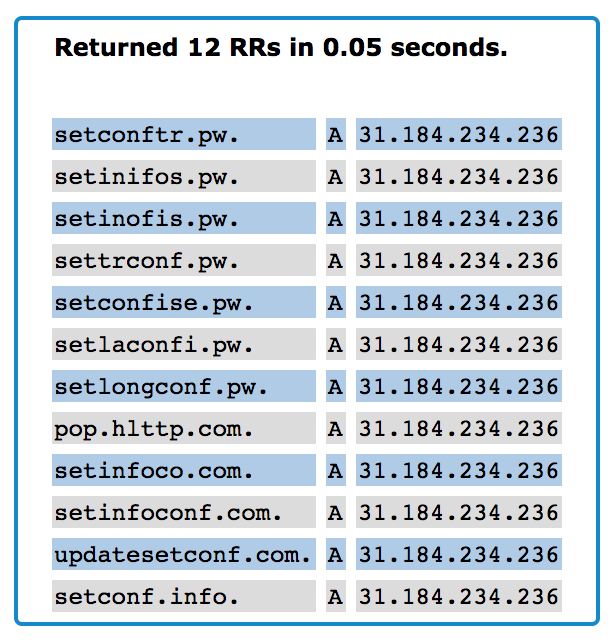 A review of some of the domains in passive DNS gives us some other important clues. While most domains are only registered for the minimum of one year, the attackers have chosen to maintain the registration for a longer time on other domains such as 'pp24.ws'. That domain is home to an online marketplace for buying and selling stolen credit card numbers, stolen ssh account credentials and more. Passive DNS also reveals instances where the attackers have hosted domains belonging to different registrants on the same IP address. 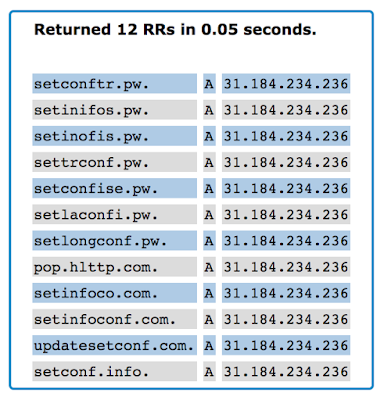 For example, when Talos analyzed the passive DNS records for one of the attacker's domains: 'setinfoconf.com' we found that this domain was hosted on a single IP address for a couple months in late 2016 before being parked. 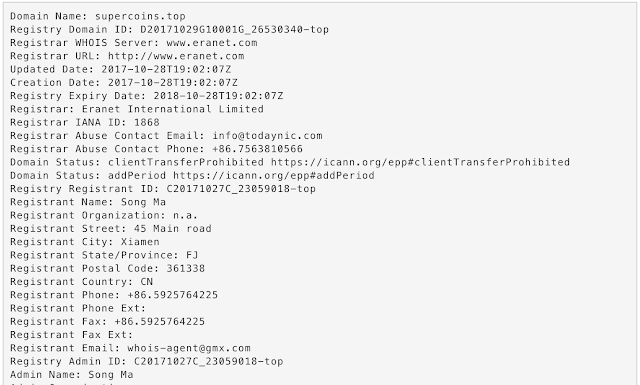 When we reviewed the other domains living on that same IP address we saw a bit of a pattern, and most importantly, some of these domains were NOT in the list of domains owned by 'whois-agent@gmx.com'. When we check the registration information for one of the above domains 'setinofis.pw', we find that there is a different registrant. This time the email address used to register the domain was 'whois-protect@hotmail.com'. Just as with the 'whois-agent@gmx.com' address, this is an attempt to appear to a casual observer that the domain is protected by whois privacy protection when in reality this email account appears to be under the direct control of the attackers themselves. Reviewing the list of 1103 domains (Domain Tools as of January 17, 2018) associated with the 'whois-protect@hotmail.com' email address we see much of the same illicit activity we saw before. Checking the registration on some of the domains associated with 'whois-privacy@hotmail.com', we can find some domains in which there are other registrants and the whois-privacy@ address is simply an Administrative and Technical Contact. 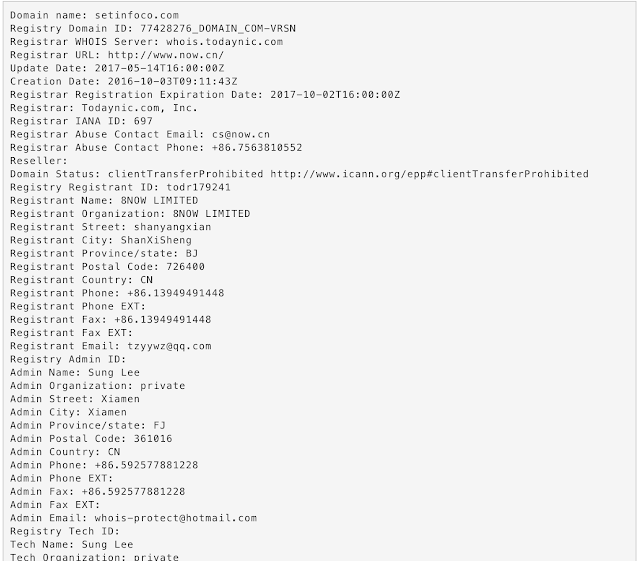 This reveals an additional registrant email address employed by the attackers, 'tzyywz@qq.com'. According to Domain Tools (as of January 17, 2017), that qq.com email address is associated with over 2500 domains. 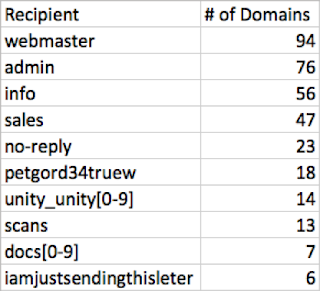 Most of the domains belonging to this registrant email appeared to be domainer-style domains located at TLDs such as .bid and .top, but we also see a heavy dose of illegitimate looking domains in the set as well. We can associate even more registrant email accounts with these same threat actors using similar techniques. While researching passive DNS for one of the domains we found previously, 'blokochain.info', we ran across something very interesting. That particular domain was hosted October 21, 2017 on the IP address 47.254.18.28 which belongs to Alibaba as part of their cloud hosting product. 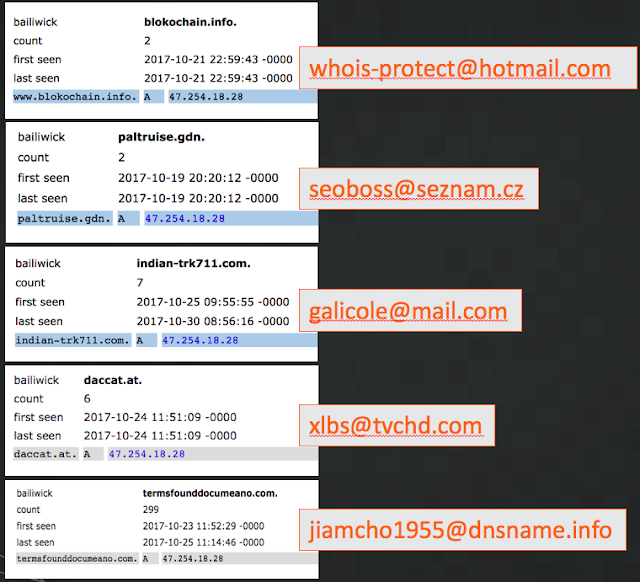 When we analyze all the other domains which have been hosted on that same IP we see many domains that belong to the registrant email addresses we already knew about, 'whois-agent@gmx.com' and 'whois-privacy@hotmail.com'. 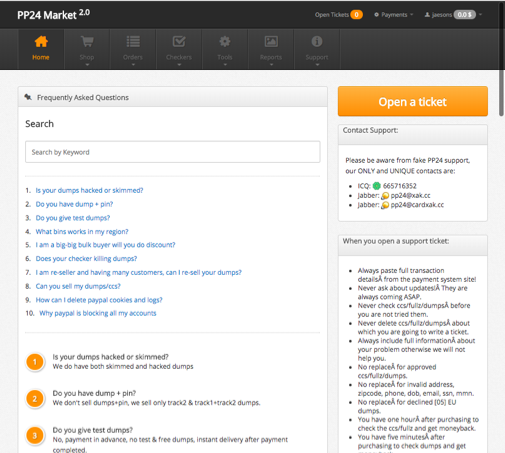 However we also see several domains associated with different registrants. Looking at the list of domains found on this same Alibaba IP we find the domain 'paltruise.gdn'. This domain is registered to the registrant email address, 'seoboss@seznam.cz'. This registrant has registered 125 domains (Domain Tools as of January 17, 2018), many of which have been linked to malicious activities. According to these links, domains associated with this registrant email have been used as part of the Rig Exploit Kit infrastructure. The domain, 'paltruise.gdn', was hosted on the 47.90.202.68 Alibaba IP address on October 19, 2017 --only two days before the IP was used to host domains belonging to 'whois-protect@hotmail.com'. The domain 'indian-trk711.com' belongs to the registrant email address 'galicole@mail.com'. The 'indian-trk711.com' domain was hosted on the 47.254.18.28 IP on October 25th through October 30th, 2017 --also very close to the timeframe in which we saw the IP hosting the other malicious domains. The domain 'daccat.at' is registered to 'xlbs@tvchd.com'. A Google search for this domain produces this link at Hybrid Analysis and indicates that this particular domain was contacted as part of a piece of malware. At Virus Total, 50/68 antivirus engines detect this particular sample as malicious. 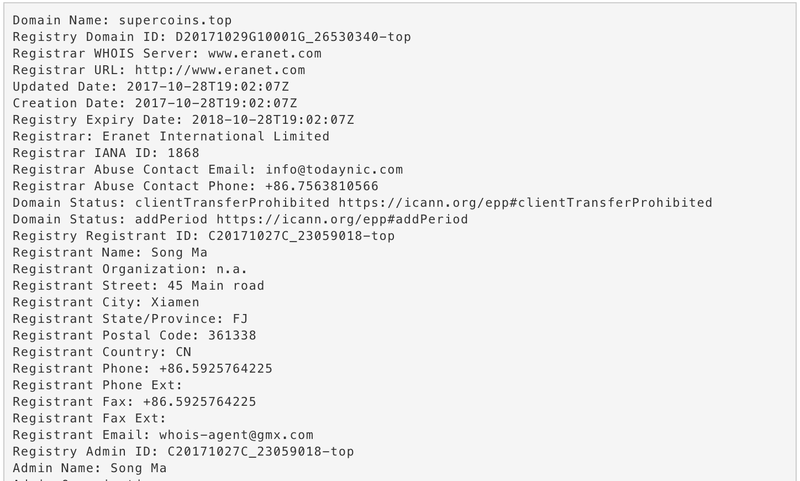 Searching Google for this registrant email address yields multiple links to malware that reaches out to domains owned by 'jiamcho1955@dnsname.info'. Virus Total corroborates this information showing 48 and 53 antivirus detections respectively. Reaching out through various contacts, Talos was able to confirm that, in fact, a single Alibaba cloud instance was controlling this same IP address for the entire time period from October 19, 2017 through October 30, 2017. Is this IP address some part of a criminal domain hosting service? Or is it that a single nefarious enterprise is behind all of these various registrant email accounts and their associated domains? Only the criminals involved in this enterprise can say for certain. Talos continues to monitor this situation with an eye towards further deciphering the business model deployed by these miscreants. Now that Necurs is back from their regular holiday break they are attempting to fill our inboxes with junk mail and malware once again. On one hand, the size of the Necurs botnet, and its ability to send from different nodes in every campaign makes it difficult to defend against; Standard IP address blacklists are ineffective against such tactics. Fortunately for network defenders, the fact that Necurs does relatively little to curate their recipient database limits the damage they can do. There are only so many times the same recipients will fall for Necurs' same, repetitive tricks. We can expect that Necurs will continue to try variations on some of their tried and true attacks, and so user education against these threats remains paramount.